Resource theories are a generic approach used to manage any valuable resource, such as entanglement, purity, and asymmetry. Such frameworks are characterized by two main elements: a set of predefined (free) operations and states, that one assumes to be easily obtained at no cost. Given these ground rules, one can ask: what is achievable by using such free operations and states? This usually results in a set of state transition conditions, that tell us if a particular state \( \rho \) may evolve into another state \( \rho ' \) via the usage of free operations and states. We shall see in this chapter that thermal interactions can be modelled as a resource theory. The state transition conditions arising out of such a framework, are then referred to as “second laws”. We shall also see how such state transition conditions recover classical thermodynamics in the i.i.d. limit. Finally, we discuss how these laws are applied to study fundamental limitations to the performance of quantum heat engines. N.N. acknowledges funding from the Alexander von Humboldt foundation. M.W. acknowledges the Swiss National Science Foundation (SNSF) via the NCCR QSIT. M.W. 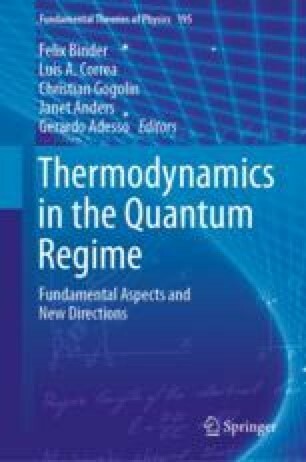 would like to acknowledge the COST MP1209 network “Thermodynamics in the quantum regime”, to which he was a member and from which part of the research reviewed in this chapter was made possible.